Daily Illuminator: Preorders Open For The Munchkin Collectible Card Game! January 12, 2018: Preorders Open For The Munchkin Collectible Card Game! 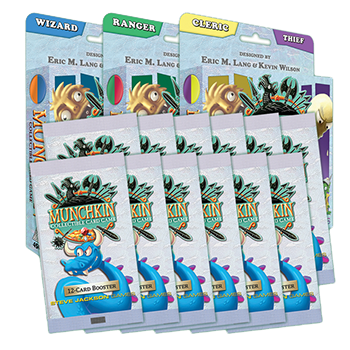 The Munchkin Collectible Card Game is releasing in February, and you can reserve your own starter sets and boosters right now at your local game store or on Warehouse 23! A starter set is the perfect introduction to the game for new players, and has enough in the box for two to play right off the bat. You get two 40-card decks, plus all the tokens you'll need, and a bonus booster pack to let you and a friend expand your game! If you have never played a collectible card game before, or the idea of collectibility makes you wary, you can play a full, fun game out of the starter, no extra boosters needed. In fact, we did just that on #SJGamesLive - take a look! For players looking to collect more cards to customize their decks, the booster packs are what you want. These packs include 12 random cards, including various rarities, and even cool alternate-art cards! Find the perfect card for your class . . . or maybe you'll come across one of John Kovalic's alternate-art Hero cards! We are opening packs weekly on #SJGamesLive, and have pulled some amazingly cool cards, like an alternate-art Dwarf Cleric, and a lot of full-art cards. Check out our streams on the Munchkin CCG Facebook page! If you want to try before you buy, make sure to check us out at booth 104 at PAX South, or find a prerelease event at a game store near you. You can also preorder at your store using the preorder form; just let them know what you want and give them the form with your information. If you don't have a store near you, Warehouse 23 preorders are also open now, but quantities are limited. You can always read more about the game, including interviews, individual cards, and rules articles, at munchkinccg.game. Preorder soon to get this awesome loot in February!